Including vegetables in everyday meals comes naturally to many of us as we eat loads of raw salads and stir fry vegetables for every meal of the day. Are you on my side eating loads of vegetables? Oh no? You hate them? Or don't know how to eat vegetables in every meal? I do come across many of those people too who are clueless on how to include vegetables in every meal of the day and breakfast is the most difficult meal of the day if they want to have vegetables. Who eats vegetables for breakfast many of them exclaim. I understand as even my husband is one of those people. 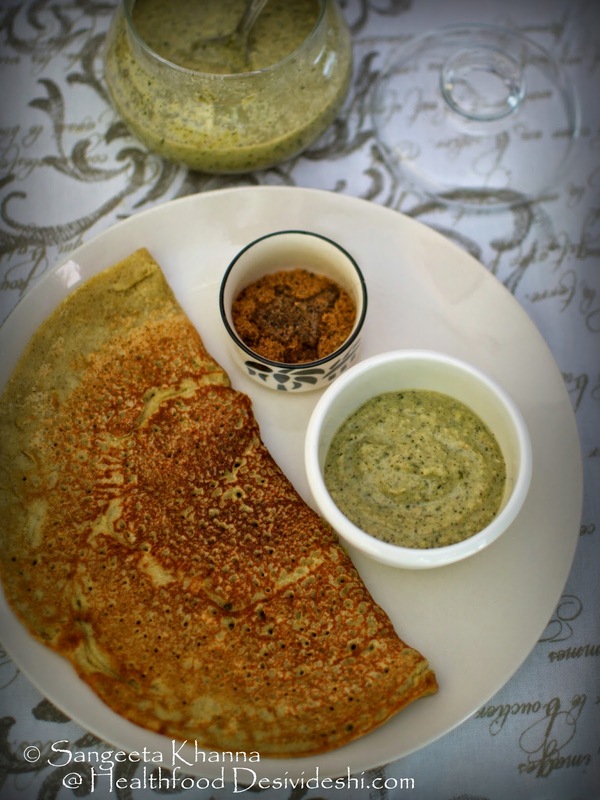 He is totally a fruits and pancakes person when it comes to breakfast but he occasionally likes these dosa (savoury crepes or pancakes) and chutney for breakfast too. In fact when I make a large bowl of chutney and keep it on the table, he takes second helpings if the chutney is not too hot. Eating a vegetable based chutney can make you consume about 200 gm vegetables with your breakfast. Just remember to make the chutney really tasty and keep the heat quotient lower than usual if you hate to start your day with spicy hot breakfast. Ivy gourd or kundru is one such interesting vegetable that has natural tangy taste and responds really well to chutney recipes. And what is more interesting, that kundru can be eaten raw as well. 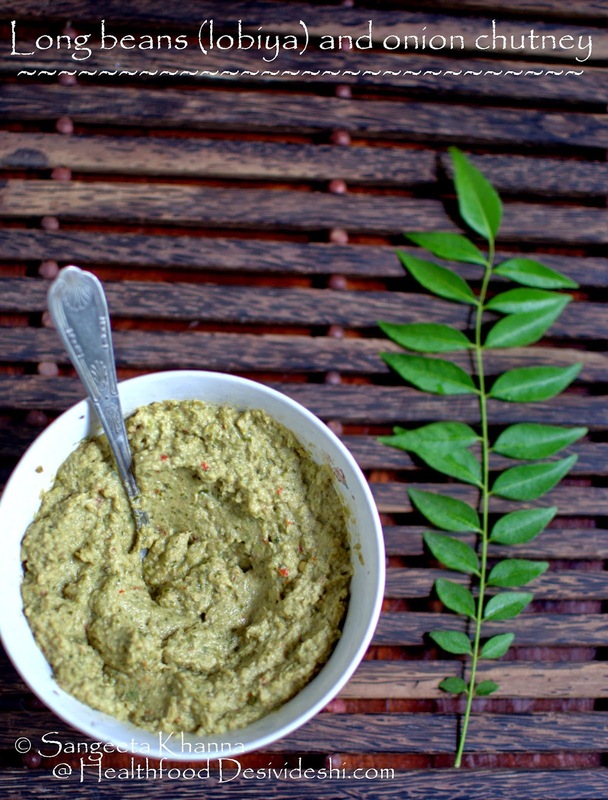 Although I like raw slices of kundru in some tossed salad, I usually half cook the vegetable while making chutney as it enhances the taste and helps balance the flavours. Heat oil in a pan and tip in the mustard seeds, red chillies, curry leaves and split chickpeas in that order. Let them sizzle and get aromatic and then add the sliced onions. Caremalise the onions on low flame for about 5 minutes. Add the ivy gourds (kundru) and salt and cook covered for 2 minutes. Take off the stove and let it cool. Add the tamarind (paste or extract) and blend in food processor or mixie to make a smooth paste. Serve as desired. 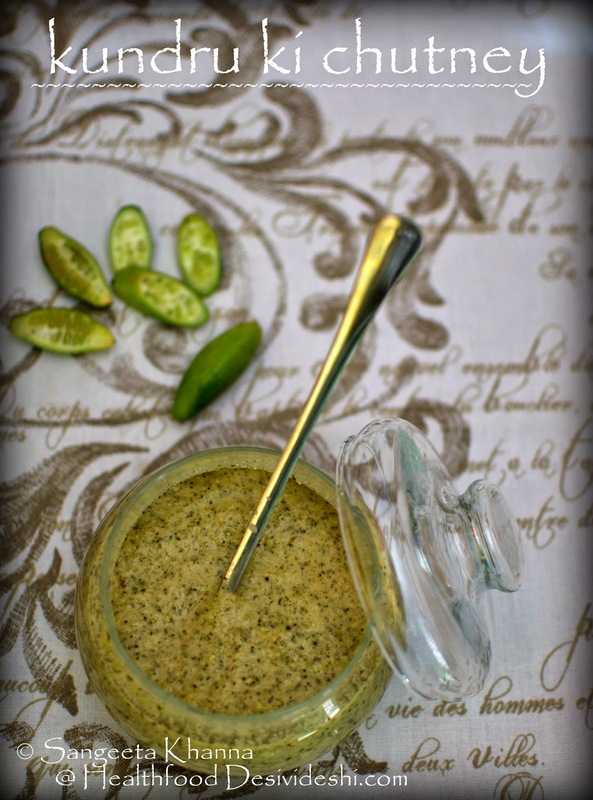 This chutney is great with idli, dosa, chilla and savoury crepes. Even with parathas for breakfast along with some yogurt. I make another chutney with lobiya (long beans) that has become a favourite. It was made as an experiment one day when I found that the maid had chopped a lot of lobiya and I needed to finish it. I decided to add a lot of ginger to it and it tasted hot gingery when fresh. But I was surprised to know that the chutney taste way better the next day, the flavours more balanced and no strong ginger taste. So if yo are planning to eat the chutney fresh, add a little ginger and if you are planning to eat it the next day as as much ginger as you want. I mean add loads of fresh ginger root and see how the chutney becomes a 'hot' favourite. Heat the oil or ghee in a pan and tip in the cumin seeds, chillies and curry patta and let them fry till fragrant. Add the ginger and then the onions. Let these cook till the onions get pinkish brown. Add the lobiya (long beans) along with salt and stir fry for 2-3 minutes and then cover and cook on low flame. Take off the stove, add coconut and tamarind and blend the chutney as desired. You might like a coarse consistency in this one. I like it any which way. 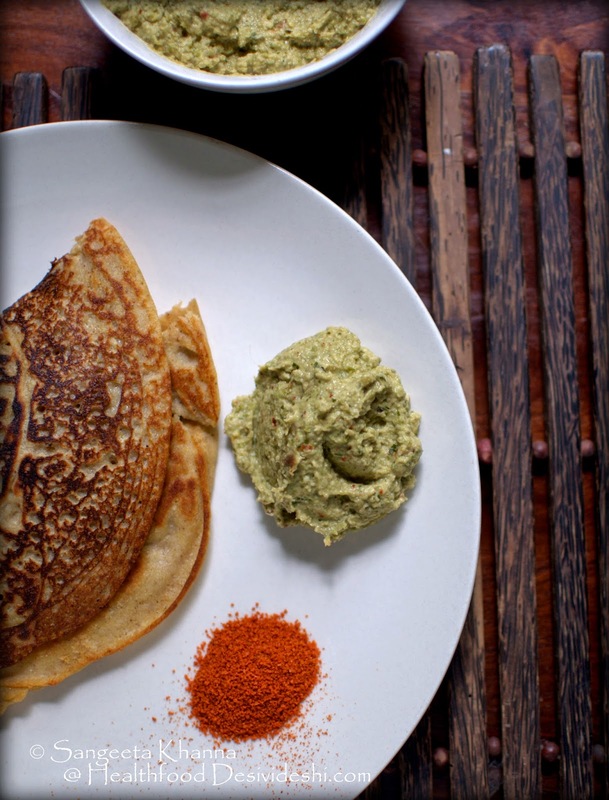 I enjoyed this lobiya chutney with a buckwheat dosa one day along with a dry methi (fenugreek) chutney that I had brought from Pune last year. The dry methi chutney is so good I am hoarding it in my freezer. I have another lasun chutney from the same place and I love adding that too sometimes to my plate. 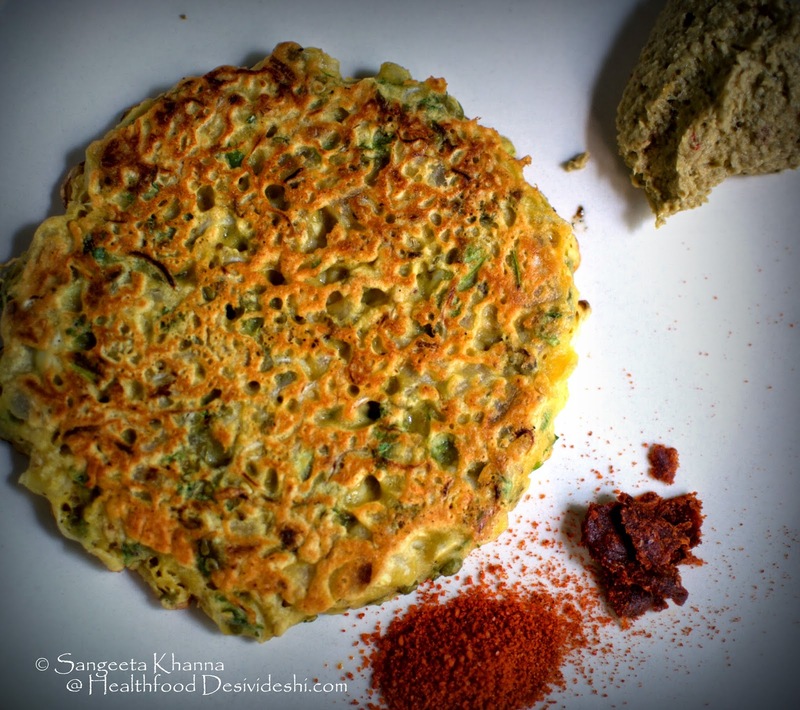 The other day I made a besan ka chilla with loads of onions and mung sprouts and had with these yummy chutneys. These chutneys helps make friends. My maid took some of the lobiya chutney home and said she shared with her neighbor and got complements. hey Sangeeta, I loved your chutney ideas. the kundru one sounds too interesting. Since I have kundru at home , let me try this. please share the recipe of how to make dry lasun chutney. 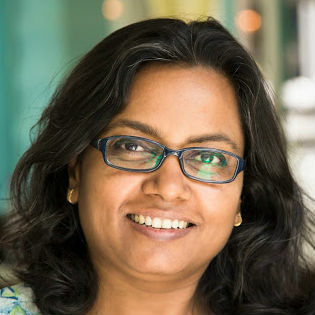 Brilliant Sangeeta! This is really clever and a refreshing take on chutney. Can you also post recipes about the dry chutneys you mentioned. I know they are store bought but i also know that you can unravel the ingredients and recipe and enlighten your readers. All the best!